Making a detailed post after a long time. In the chart above have put in fibonacci retracements and trendlines over a long term chart. Below are a few observations and then we would come to conclusions. 1) Sensex has moved up from 2613 or 2900 ( any of the starting points would get to similar retracements) to a level of 21200 in the Bull Run spanning 5 yrs + . The correction has been sharp which is generally the case after a major bull run in a bull cycle and consolidation takes any where between 5-8-13 mths before it can resueme . 2) Considering that correction is of the entire bull run the retracements would be 38.2 % , 50 % and 61.8% . The approx calculations ( diff starting points ) for the above levels are 14100 , 12000 and 9800. Technically the correction should stop at any of these points before starting a consolidation and stabilization phase which could take a good amount of time coz that would mean collecting strength for a new phase which can be almost similar to current one we had. So assuming that we may see a low arnd 5th month or 8th month ( just a fibo assumption quite some of them have been use earlier only to get a brief time zone) . 3 ) As per historical observations ( will be taking a view of Dow Jones as before will see detail in another post ) falls after such a big run tend to be very sharp and go to an extent of 40 % or lil more in absolute value of the top. According to that calculation shaving 40 % of 21200 would be 12700 + or - 100 . 4) Another important aspect of technical analysis is trendlines and channels . As we see on the chart there are two trendlines shown which look appropriate for use. As trendlines tend to slope upwards and we will get different levels every few days so assuming the 5th and 8th month levels we will take approx levels. For trendline 1 level comes around 12500-12700 and for trendline 2 ( yellow on the chart ) level comes to 13500-13800 aprroximately . 5 ) We have observed factors on the long term charts. Lets have a look at short term charts we have two down channel possibilities ---- CHECK chart click here . One comes to around 14000 and other at 13500 -13600 roughly . 1) According to fundamental valuations as per reports/projections of fund houses , FIIs and lot of fundamental analyst projections of eps fy08-fy 09 etc some of which are old reports the fair value comes to anywhere around 13000 ( +- 500 ) .Also below those levels FIIs would be hurted the most as they r the major stakeholders in the index ! redemption pressures ( panic selling ) , institutional investor failures ( BSMA and FII selling ) , Retail withdrawal ( we have already seen quite of it ) , inflation concerns ( not much impact was given in earlier projections. ) . Some of the risks are already discounted and other impacts are being seen now and markets discount earlier then economic data does. So ideally we would see a bottom in financial markets before a high in economic data ( which analysts say to be around Oct 08 -Jan 09 ) . 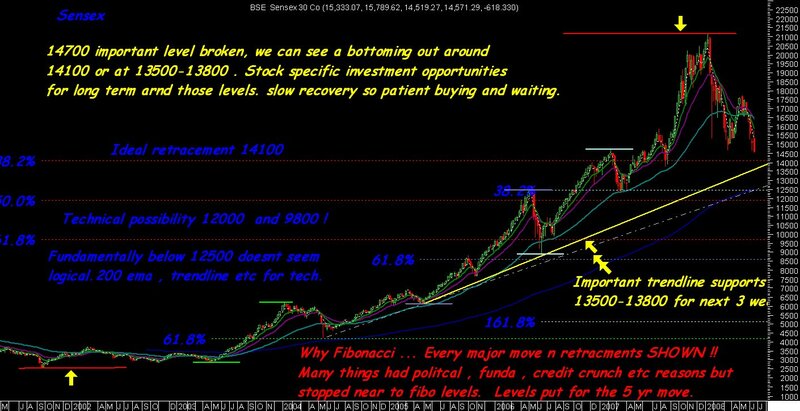 From that point of view anything closer to 13000 -13500 would be an ideal investment opportunity but will need patience. As my prowess in fundamental analysis is highly questionable ( smiley 😉 ) majority of the above fundamental observations are just a brief reproduction of possible projections and would not delve much into the subject . 1) Of the 3 possible fibonacci retracements it would be apt to reject the 9800 figure and to logical extent also the 12000 figure also . So would consider 14100 as a fibonacci bottom area. 13500-13800 and 12500-12700 are trendline bottom zones in short term . 2) According to the historical observation ( dow Jones ) 40 % cut in absolute value and fundamental projections come to around 12700 and 13000 odd. Assuming fibonacci time calculations we are in the 5 th month and oversold in short term the technical bottom would ideally be 14100 and in worst case 13500-13700 in the near term where markets would find support and retreat upwards the levels for which can be considered after some sessions and intermediate bottom confirmation . Considering the correction phase to continue till 8 mths which is the worst possible scenario if risks / sentiments apart from the ones included ( suppose crude oil crosses 150 , govt falls , global cracks ) comes into play and such pressures could only be a temporary setback and a jerk which may not sustain on lower side. Then also by end of September the possible projection would be 12700 roundabouts . But even if that has to come ideally we would see a very good pullback from lows ( 13500 -14100 ) and Sensex retracing upwards from the lows . Also we could see a consolidation phase start from low made in June /July itself if no new low is made by September which is the more probable case at current juncture and matters now. 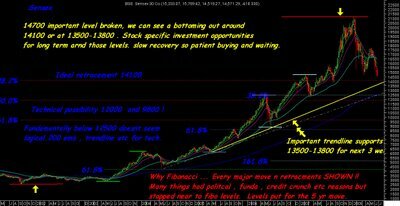 This is a major correction phase after the first part of the bull run in the cycle and investors are again getting good opportunities so staggered buying should be done at 14700-14100-13500 levels. Have not included 12700 -12000 levels to wait for as fundamentally such levels could be seen only in circumstances which are not necessary to happen ! . The possibility of seeing 12500 is on very much lower side and as per the analysis would be a jerk only. Ideally the horizon would be from 6 mths to 1-4 years for investors taking exposure now and returns could be great if the projections we are looking at are right. Few years back we had come out with a bold report at 8000 and has been discussed on the blog many times which was titled POST 8000 BOOM or DOOM in the mont of Sept , 2005 where in the projection stated was for 45k -77k by 2018. Download the presentation from the link given below . 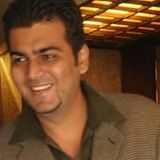 Comments are invited on the above views and if u like the stuff around so more people can comment on the same . As there are much more aspects which can be considered and few of our technical observations and conclusions have been put up and some more will be seen in next post. 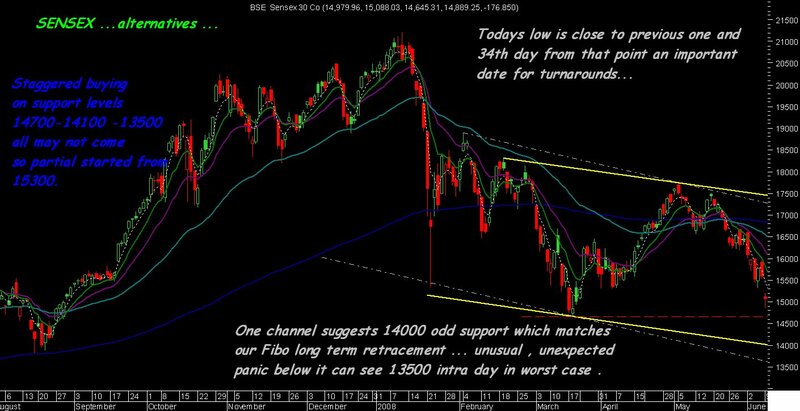 For learning technical analysis or subscribing to exclusive recommendations mail to noorrock2002@gmail.com and check http://analyseindia.blogspot.com for details.